My husband and I love SpaceBalls and decided we needed to finally make it happen. I went as Dot Matrix and put together my costume with various gold clothing pieces I bought. I put shoulder pads in and made my VIRGIN ALARM out of felt with Gold Piping around it. My husband bought the worker overalls and found an iron on BARF patch. He also found a BARF wig. He added the fur to his boots and gloves and made fur cuffs. The tail is a cat tail costume but it was the perfect color. 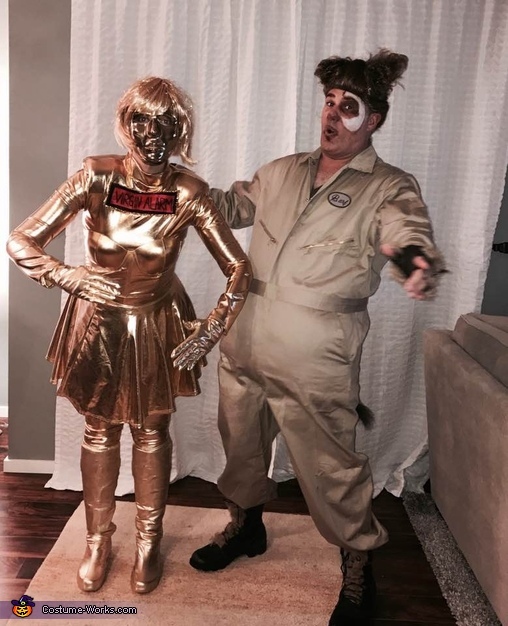 Both costumes were under $50.00 to put together and we won $500 for best couple costume at a local brewery party we went to. I can't even tell you how many people came up to us yelling BARF or DOT!